In 1859 prepayment of letters was made obligatory. 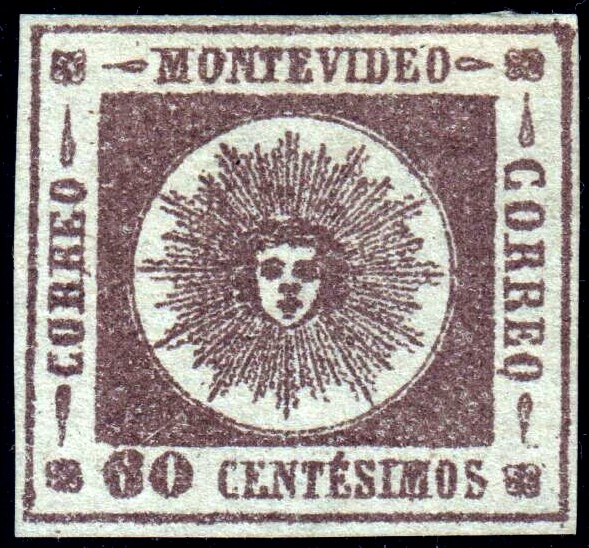 The same rates were in effect, but a new series of stamps was issued, this time officially by the government of Uruguay. These stamps were printed in sheets of 204 stamps, 17 rows of 12. Blocks of 20 stamps were used to make the stone, and therefore each value can be found in 20 varieties. The 60 centavos and the 100 centavos were made from the same stone by altering the value figure, so they share many varieties. The same is true for the 120 centavos and the 180 centavos, which were produced in the same manner. The next issue (Scott #13 - 17), from 1860, share the same design, but have thicker numerals, supposedly to make them easier to see. This issue has been extensively forged. Have a look at Bill Claghorn's excellent Comparative Forgery Identification Site. For more on stamps from Uruguay please see Uruguay, carrier issue.